Like most small business owners cash is in high demand. But it doesn’t have to be if you always think barter first. Learning how to trade your product or service can be the lifeline of your business. This simple guide can help you catapult your small business no matter what stage you’re in. If a client (or you) can’t pay with traditional means, it doesn’t mean anyone needs to call small claims court. Instead, what about bartering? You may be imagining old-time scenarios of doctors accepting a bushel of farm goods in exchange for medical treatment, but bartering is alive and well in the modern age. Here’s why small businesses should consider bartering. Related: What Exactly Is A Barter Exchange? 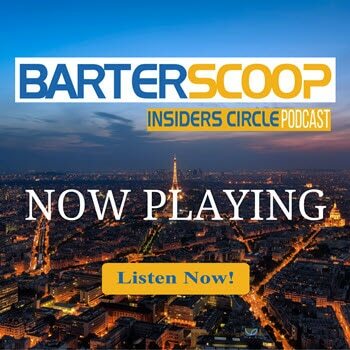 John Strabley, CEO of IMS Barter, says savvy business owners are discovering that bartering is a great way to boost sales production because it’s a vehicle for using downtime, moving excess inventory, attracting new customers and generating barter dollars that can be used for advertising and other business expenses. For example, if you have excess inventory, you may liquidate the merchandise for a reduced profit, he says. Alternatively, you can trade that merchandise through a barter exchange—and often receive trade credit for its full wholesale value. You can then use those trade credits to purchase the services or products you need to run your business. And because barter exchanges connect new buyers and sellers, your business can potentially earn greater exposure and a new customer base. Bartering is a great way to get products and services that might otherwise be unaffordable, says Tony Rotter, owner of Tony Rotter Woodwork in San Diego, California. Sandy Arons, founder and president of Arons & Associates Divorce Planning in Brentwood, Tennessee, has also used bartering to obtain services she wouldn’t have otherwise received. She provided financial counseling to a photographer and in return got a photo shoot with her children. She also helped a dermatologist create some marketing materials and received an equal value in her services in exchange.